Happy Birthday Cable Park! The cable has been running for 10 years now! We are so excited that we decided to have a birthday party for ourselves! noon-6pm: Open Riding $10 includes rental equipment! Make sure you come celebrate with us! Start your day at 12, riding the cable, shredding some gnar for only one benjamin! Take a break and gear up with discounts in the pro shop! Finish your riding and either get signed up for yard game olympics with sweet swag for the winners, or grab a drink and jump on the lazy cable river for some laps of relaxation. Big DJD will get the party turned up around 6 to dark. Grab some brews and some hamburgers while we light the bonfire. 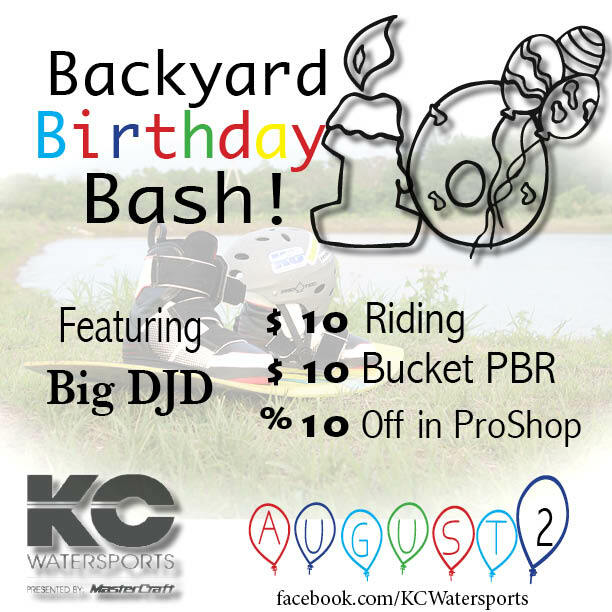 Grab some friends, a ten dollar bill and get ready to say Happy Birthday to the best cable park in the midwest!